$25 includes tax and mailing. All proceeds from apron sales help to underwrite The Beat Divas’ many endeavors. Everyone needs an apron! Send one to someone you know. Or two! 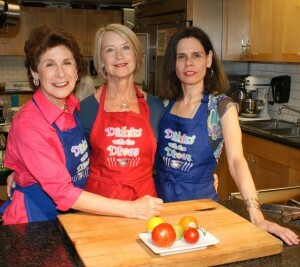 These are the same aprons we wear in our cooking classes. Aprons are 60/40 cotton/poly, with adjustable neck strap and two pockets. You, too, can cook like a Diva! Sing like a Diva too! Folks who wear our aprons have been known to break into spontaneous song. High notes included. Mady Kaye, 4906 West Park Drive, Austin, TX 78731.